Are you for the light side of the force and want to become a heroic Jedi Knight? Or are you more for the dark side and want to become a Sith Lord? Whatever side you’re on, always remember to have your most important weapon with you at all times, the Lightsaber! Funidelia is definitely the best place to find this, let’s say, almost mandatory accessory for any Jedi Knight or Sith Lord Star Wars Costume. 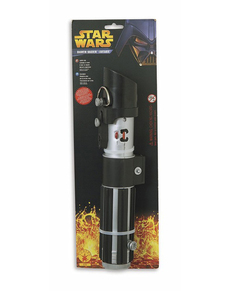 In our online catalog you’ll find a wide range of options when it comes to Official Star Wars Lightsabers. 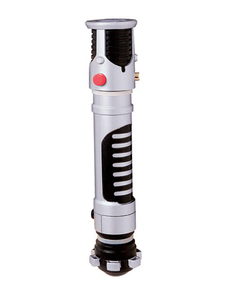 We’ve got absolute replicas from all the Star Wars movies at Funidelia.You’ll discover the most classic models, such as Darth Vader’s lightsaber or Luke Skywalker’s Lightsaber, as well as the latest movie models Kylo Ren or Darth Maul Lightsabers. 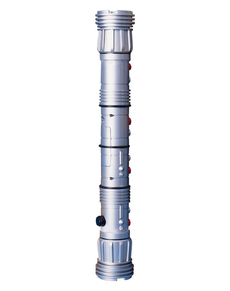 On this page you’ll find both red-coloured Lightsabers used by Siths as well as Blue and green models used by Jedi’s. The Lightsaber is seen in all of the the Star Wars Movies. The first time we were introduced to the lightsaber was when Obi Wan Kenobi offered Luke Skywalker the sword that had belonged to his father, Anakin in Episode IV- A New Hope. 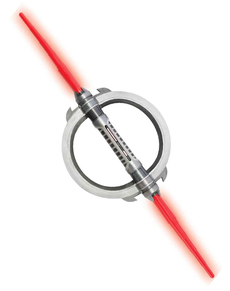 Since then, they have become one of the most popular accessories among fans of the saga to the point of being difficult to imagine the entire Star Wars universe without their laser swords. 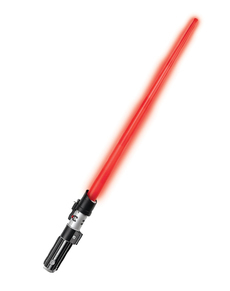 Throughout all the episodes, we can see epic battles between Jedis and Siths using these elegant and bright weapons. 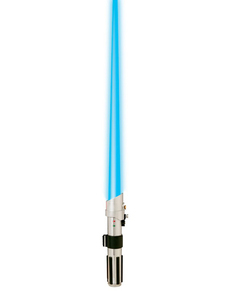 If you’re thinking of becoming one of the lead characters of these duels, either hero or villain, at Funidelia you can buy your Jedi or Sith Lightsaber online. 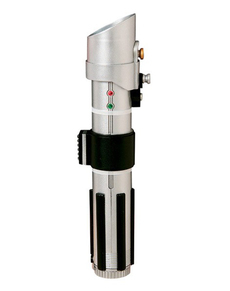 Any event, celebration or party would be a great excuse to take out your lightsaber. May the Force be With You! Lightsabers are the quintessential weapons of a Jedi Knight but also that of a Sith Lord. They were first created by the warriors themselves, it is a weapon that ignites the Energy Blade from its Hilt and has various colours, depending on the minerals used in its manufacture. In addition, the Star Wars universe goes beyond the film industry as we also know about it from cartoon series like The Clone Wars and Star Wars Rebels. 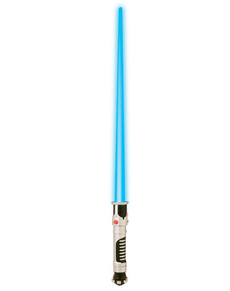 From these series, we can learn that other coloured lightsabers actually exist. 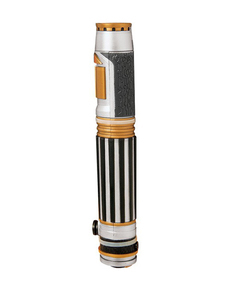 There are yellow lightsabers(used by the Sentinel class Jedi) as well as black and white. Blue is the color used by the Jedi Luke Skywalker in the film A New Hope as well as by Obi Wan Kenobi and Anakin Skywalker. 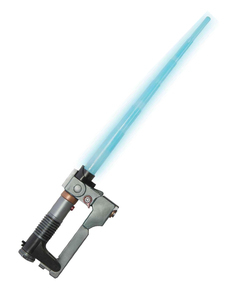 Blue Lightsabers are generally associated with those Jedi who have the role of Guardians and are prepared for combat. 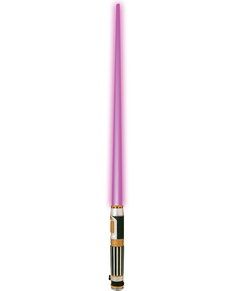 The purple lightsabers are the rarest and only a very powerful Jedi knight can use them. This is the case of Mace Windu in the episodes of the prequel trilogy (I, II and III). 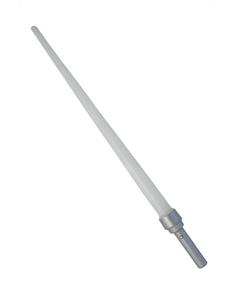 We can see this sword in action in the scene of the Jedi in the arena in the movie The Attack of the Clones and in Episode III - Revenge of the Sith, when Mace Windu tries to capture Senator Palpatine. 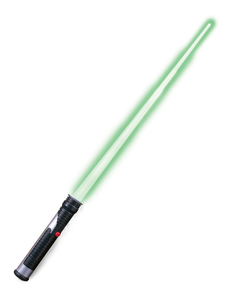 The Green Lightsabers are used by Highly ranked Jedis as it’s related to the intellectual abilities of the Force. The first sighting of a green lightsaber was in the Return of The Jedi- it was Luke Skywalker’s weapon in this episode. They were also used later on by Yoda and Qui-Gon Jinn. As well as their use in battles, we can see how they can cut things and even fire shots. 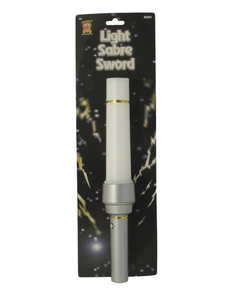 We have seen various types of Lightsabers throughout the course of the sagas. It is one of the first weapons we discovered in the movies, in addition to it being associated with one of the main heroes of the saga. It is the weapon that defines his character as a Jedi Knight. 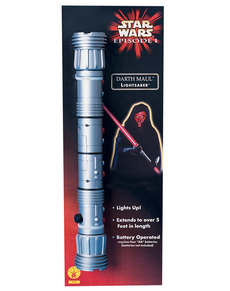 Darth vader’s Lightsaber is one of those that belongs to the dark side of the force with the other fearsome Lord Siths. 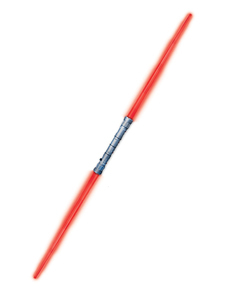 With a bright red blade, this lightsaber is used in the exciting battles with Luke Skywalker from the episodes of the first Star Wars Trilogy. This is the sword you need to get a hold of if you want to dress up as the most famous villain of all time. 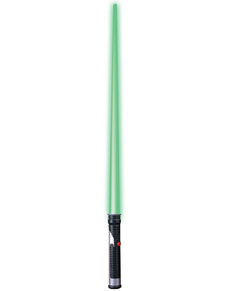 Bring your helmet, voice changer and lightsaber to the really stand out at the party. 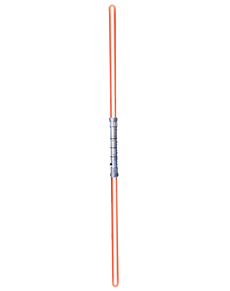 In Episode I - The Phantom Menace, a new Sith Villain emerges with a red double bladed lightsaber one that is different from any other lightsaber in the movies. 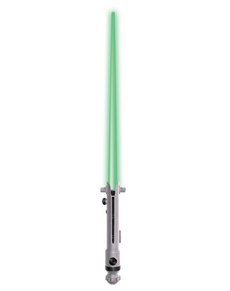 This weapon shows off all its power in a fatal duel between the Jedi Master Qui-Gon Jinn. 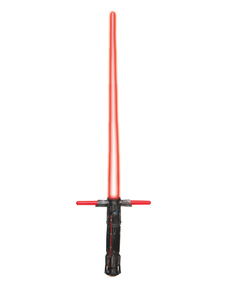 In our online store you can find the double laser sword of Darth Maul to complete your costume, if you decide to dress up as this villain with red and black face. The first episode of the last trilogy, The Awakening Force (Episode VII) also presents an innovative version of these weapons: Kylo Ren's lightsaber. This red-speared sword features two lateral protrusions reminiscent of a medieval sword in its classic format. 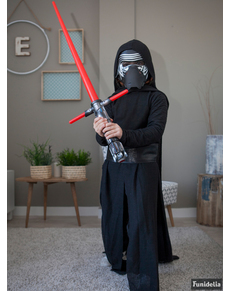 If you decide to dress up as the new Star Wars Antagonist you can find the lightsaber you need online at Funidelia. At Funidelia you can find Count Dooku's lightsaber with a curved grip, as well as other types of swords that were introduced into the expanded Star Wars universe. As for example, the Inquisitor's double rotating laser sword and Ezra Bridger's "saber-blaster", both characters of Star Wars Rebels. 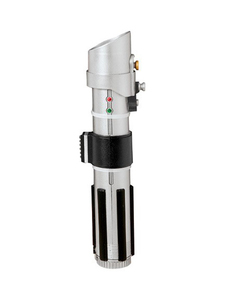 Discover the official Star Wars Lightsabers online at Funidelia. They are a great idea for a fun and unique christmas gift or birthday gift. As you can see from this page we’ve something to suit everyone's needs. The Star Wars plot and story consists of a set of conflicts, disputes between good and evil, between heroes and villains and between Jedi and Sith. There's always a battle with a lightsaber and this has converted some of them into true classics. The first lightsaber duel of the saga was in The Death Star between Darth Vader and Obi-Wan Kenobi. It wasn’t until years later the old teacher and his apprentice -totally changed- find each other again. Although the outcome this time is different from the previous. But, perhaps the most important duels from all the Star Wars movies are those that develop between father and son. Luke confronts Vader on two occasions. The first time he is still in the learning stage and was defeated in Bespin. In the Return of the Jedi, a new confrontation takes place that has a very different end that determines the fate of the galaxy. The prequel trilogy sees lightsabers back in action. There is a three person battle as the master Jedi Qui- Gon Jinn and the young obi Wan take on a Sith villain Darth Maul. There’s more… We’re also able to see a huge gathering of Jedis and countless lightsabers in various colours on planet Geonosi. As well as the two clashes between Count Dooku, Anakin and Obi Wan or the duel between Obi Wan and General Grievous holding a lightsaber in each of his four hands. 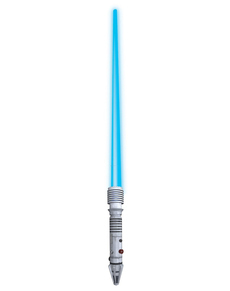 In the new sequel trilogy, fans of these bright weapons discover Kylo Ren's new lightsaber and witness the fight in which Rey uses Luke Skywalker's lightsaber to defend her friend Finn. Surely by now you’re feeling “the force” to dress up! Whether it’s a Jedi or a Sith, choose your favourite character and don’t forget the fundamental accessory that will have you travel to a galaxy far far away..
At Funidelia you will find a great selection of official Star Wars lightsabers of various colors and models, which you can use to complement your costume. Surely you’ll surprise some fan with such an original gift. Now you just have to decide which side of the Force you are going to join!